From choosing the right touch-up paint and shades to performing an effective and virtuous job, painting can be tricky. 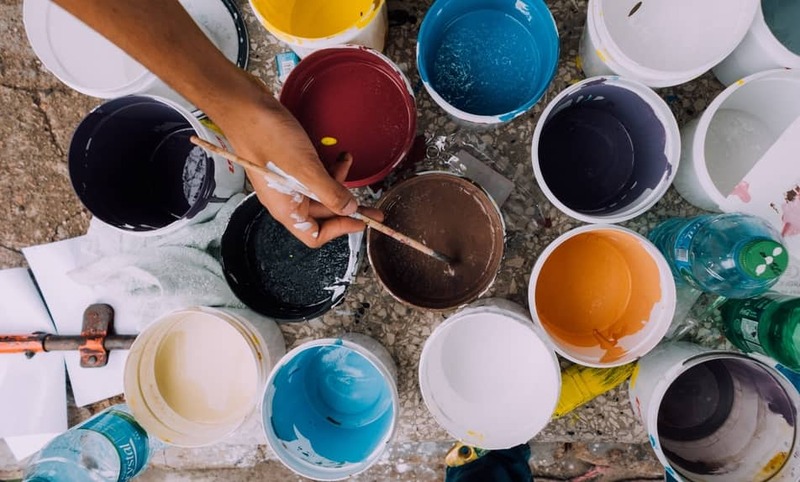 Yet, one of the main concerns both professional and amateur painters have is associated with the potential health and safety hazards that come with volatile organic chemicals in paint. In fact, most of today’s paint contains harmful chemicals known as Volatile Organic Compounds, which are released into the air and cause serious environmental and health issues. How Do Volatile Organic Compounds Affect the Environment? VOCs are organic chemical compounds which contain carbon, including methylene chloride, benzene, and formaldehyde. Such chemicals act as both indoor and outdoor air pollutants. Whether the source of emissions is natural or man-made (e.g., vegetation and exhaust fumes, respectively), VOCs have an adverse effect on the environment. Unfortunately, there’s a wild variety of hazardous gas released into the atmosphere. When it comes to paint and other architectural coatings, various compounds are used as organic solvents to facilitate performance and improve quality. Formaldehyde is among the most utilized VOCs in paint. Nevertheless, any domestic or industrial exposure to paint can lead to numerous health and environmental risks. Fresh paint, in particular, releases VOCs at an increasing pace. Note that even storing paint can be hazardous. Numerous environmental risks and health problems have been associated with the use of volatile organic chemicals. Therefore, a smart air quality monitor is useful to follow mandatory VOC regulations. Research shows that only a one-time painting project can lead to a high release of volatile organic particles, with an increase of up to 1,000 times. Note that such volatile pollutants are two to five times higher indoors than outdoors - in both rural and urban areas. Interestingly, paint continues to off-gas years after painting, with 50% of VOCs being released during the first year. The decrease in the indoor and outdoor air quality leads to various short and long-term health problems. Common health issues include allergies, asthma, skin irritation, eye irritation, nausea, headaches, memory impairment, and “sick building syndrome”. Professional painters, in particular, are at a higher risk of developing a serious condition (e.g., liver damage). In addition, VOCs, including those in paint, have been linked to cancer. Due to the serious environmental and health risks associated with VOCs in paint and architectural coatings, more and more brands are being produced and marketed with safety in mind. Safety recommendations and label instructions should be followed carefully. Note that odors do not always correlate positively with toxicity. Effective ventilation is mandatory during and after application. The implementation of adequate equipment and painting techniques can reduce any possible health risks. In fact, any coating and painting product should adhere to safety practices. Paints must be stored away from children and pets. Note that the most effective way to store cans is upside down. Leftover containers should be hauled to an appropriate waste collection site. Opting for low-VOC or zero-VOC paints is also recommended. Note that “low” means any paint that contains less than 250 g/L of VOCs, as stated by the EPA. Interestingly, business analytics indicate that 83% of sales today are for water-based paints. Another alternative, which is quite popular among green enthusiasts, is to make clay-based and milk-based paint. As high concentrations and emissions have a negative effect on air quality and people’s well-being (dry eyes, skin and conjunctival irritation etc), manufacturers must balance quality and safety, while respecting VOC regulations. Note that common volatile organic compounds include formaldehyde and propane. Interestingly, not all chemical emissions of carbon are defined as VOCs; carbon monoxide and carbon dioxide, or nitrogen oxides for instance, are not VOCs. On the other hand, even low-VOCs may contain limited amounts in order to improve paint coats. While no-VOCs sound like a safe option, there might be other harmful chemicals which should be considered prior to painting. When painting, consider plants that remove volatile organic compounds, which can reduce possible health risks. Sadly, health issues associated with paints are similar to the health risks associated with volatile organic compounds in cigarette smoke. In the end, painting comes with a whole spectrum of risks and alternatives, but safety should always be the main standout color.